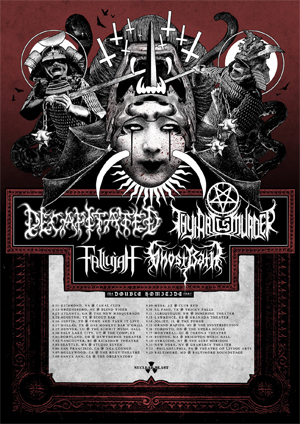 Australia’s premiere incendiary musical export THY ART IS MURDER, and Polish metal extremists DECAPITATED, will co-headline a North American tour together this August/September. Joining them are progressive death metal masters FALLUJAH and depressive black metal sensations GHOST BATH. "C.J. has returned, and so we shall return to North America's shores once again. This time we are honored to announce we will be joined by an all Nuclear Blast lineup featuring death metal icons DECAPITATED, plus our friends in FALLUJAH and GHOST BATH. "These will be the only North American dates for us in 2017 and we plan on putting on our best dresses and bringing the best show we can to your shores. Tickets go on sale Friday!" Tickets go on sale everywhere this Friday, May 5th at 10 am local time, through all fine ticketing outlets.